The billionaire real estate mogul uses a Nashville speech to emphasize his campaign is about more than him. Donald Trump says it’s not all about him. No, seriously. Campaigning in Nashville, Tennessee, Trump on Saturday paid homage to his supporters — claiming they are a part of “a movement” and using colorful language to beg for their support. GREENVILLE, S.C. -- Donald Trump campaigned Thursday in Greenville, South Carolina, telling a standing room only crowd that U.S. leaders are weak, he will win the Hispanic vote and then proved his hair is real by having a woman tug on it. Trump spoke at the T.D. Convention Center where people had started lining up at 8 a.m. for his noon appearance. The crowd was on its feet, clapping and cheering and snapping pictures as the billionaire reality show host and developer was introduced as, "the next President of the United States." UPDATE: DUBUQUE, IA (WIFR) -- It was the largest crowd ever for an event at the Grand River Center in Dubuque and Donald Trump did not disappoint supporters. It is the kind of talk we have grown accustomed to with the Republican front runner. It was brash, pointing fingers, and off-the-cuff with absolutely no prompter. "If you are running for president, you shouldn't be allowed to use a prompter, so I think about my speeches a lot and what I am going to say, but I don't use notes and I don't read speeches because it's easier, but you don't have the same vibrancy," said Trump. MOBILE, Ala. — Donald Trump walked onto the stage of his Friday-night stadium rally here to the sound of Lynyrd Skynyrd's "Sweet Home Alabama" and walked off to Twisted Sister's "We're Not Gonna Take It." The time in-between was spent touting his business success, attacking Republican Jeb Bush and Democrat Hillary Clinton, railing against illegal immigration and criticizing the Obama administration's foreign policy and foreign trade policies. The crowd of about 30,000 at Ladd-Peebles Stadium gave Trump, the front-runner among Republican candidates, a rock-star reception, applauding wildly for descriptions of his accomplishments and booing at the mention of Obamacare, lobbyists and illegal immigrants. Trump's supporters in the Mobile crowd saw him as no-nonsense and capable. They didn't mind if he ruffles a few feathers on his way to "making American great again." Donald Trump took part in a New Hampshire political tradition Wednesday, holding a town hall on the same night one of his top rivals was holding court with voters in a nearby town. 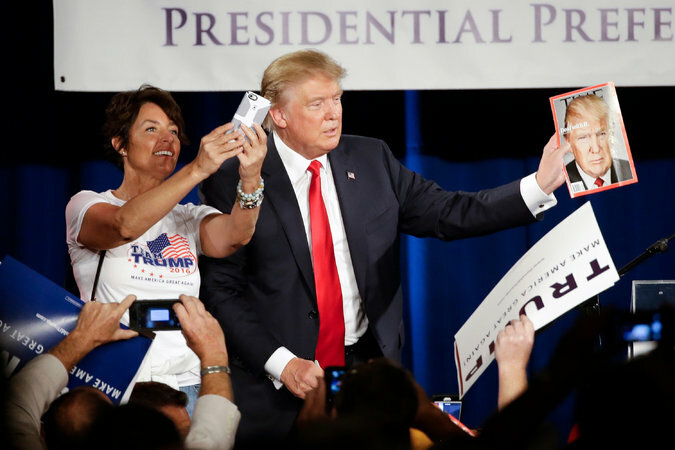 Republican presidential candidate Donald Trump held a news conference and later spoke to more than 2,000 people at a fundraising dinner in Birch Run, Michigan, on Aug. 11, 2015. And in the meantime, he's selling his strong personality and criticizing his rivals, particularly Jeb Bush for a lack of vigor. To a cheering crowd, Republican presidential contender Donald Trump continued to rail against illegal immigration Saturday, pointedly criticizing the Mexican government and pledging to build a fence along the U.S.-Mexico border, while also taking stabs other Republican presidential contenders, Democrats and the media.